The post-Potter presence of Daniel Radcliffe as the lead in this new film version of ghost story 'The Woman in Black' - already a hugely successful stage play - has no doubt been a considerable boon to box office takings so far. Aside from being an increasingly fine actor, Radcliffe has brought wider media attention to what is otherwise a low-budget, determinedly old fashioned British horror movie (from 'Eden Lake' director James Watkins) and, with the studio making cuts to secure a '12A' rating, has ensured that fans of his 'Harry Potter' movies are flocking to see it. Though this proves a double-edged sword, because seeing a horror movie in a room packed with one hundred plus 10-14 year-olds is far from ideal. Though they left me with a thumping headache by the end, I did't actually mind the shrill screams that accompanied literally every single scare. In fact I'd go as far as to say it's nice to see a scary movie surrounded by people who are genuinely terrified: one of the pleasures of cinema is sharing an experience in this way. After all, comedies are much funnier in a room full of laughing people, whilst my only positive memory of Peter Jackson's turgid 'King Kong' is when the audience audibly shuddered at some of the big, disgusting CGI insects. What bothered me about the young audience for 'The Woman in Black' is that they were "at that age" where they were determined to be part of the fun and where laughing ironically at EVERYTHING is the default social mode. It's difficult to get sucked into a Gothic horror atmosphere under these circumstances. If a fidgety schoolboy persists with shouting "dum dum duuuum" whenever the titular ghost lady appears it can be a bit of a mood killer. Ditto for the constant rustling of sweet packets and the kid down the end of my row who kept opening his carbonated drink in order to laugh at the fizz noise (before shaking it up again in order to recreate the magic). Even more annoying were the older couple behind me, whose wry comments about the noisy children were harder to filter out, being right behind my head and taking the form of conversation rather than isolated, random bursts of child-guff. Yet even in spite of this less than ideal audience situation I found the film pretty consistently compelling. In places it's truly frightening, even if it is (by design) playing on oft-seen horror tropes. It doesn't do anything new but it does the old stuff very well. 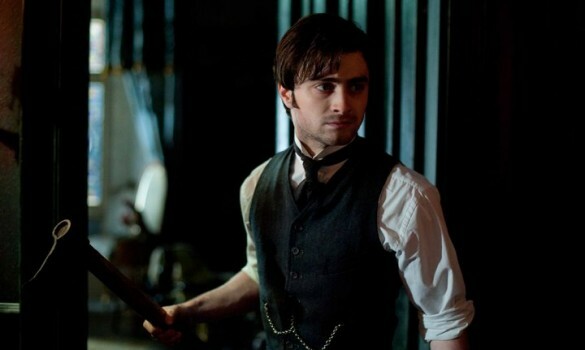 Radcliffe is a good fit for the protagonist, seeming both vulnerable and capable. Some are bound to find his youthful appearance and image as a boy-wizard a distracting incongruity, especially given that here he is playing a father, but I didn't find this to be a problem. At 22 Radcliffe is an adult who could feasibly have a child - this is simply a fact. If anything his most famous role compliments this one, with both Harry Potter and solicitor Arthur Kipps being of unfailingly good nature. 'The Woman in Black' is on general release in the UK, rated '12A' by the BBFC.